The blessing of rain is creating abundance in our native garden! Ears of corn are already fat and still growing. Ours is not the sweet corn that we grow in the midwestern United States. Since it had to survive in times of very little rain, it was ground to a fine corn meal and cooked. Many of our visitors are asking about another interesting plant in our native garden, amaranth. Two different varieties are growing side by side in our garden, one which has a light wheat colored blossom, and the other which is a beautiful dark red. Amaranth originates in Mesoamerica, and it was grown by the Aztecs. As a gluten-free alternative grain said to flourish in poor soil, it is making a comeback, and is now sold in many health food stores! We are all looking forward to a bountiful harvest this fall. 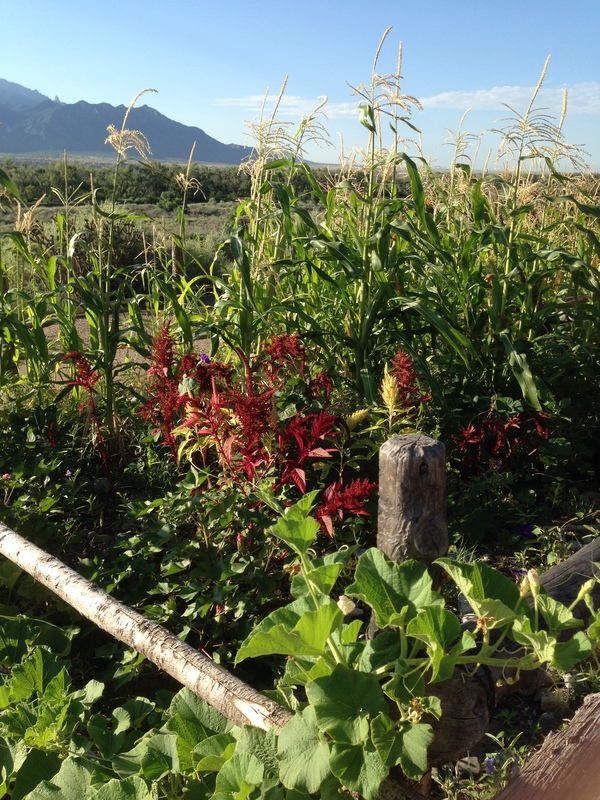 Tags: Amaranth, Ancient, Aztec, Corn, Gardens, Harvest, Native Gardens, Sharon. Bookmark the permalink. Previous post ← Honey, honey!